Find out how to be safe around buoys, marks and beacons in the Bay of Plenty. The waters of New Zealand are marked for safe navigation using the International Association of Lighthouse Authorities (IALA) A maritime buoyage system. Buoys and beacons help guide boaties through shallow water, busy channels and past hazards. They are the ‘road signs’ on the water and the different shapes and sizes communicate important information about what side is safe to pass on. When entering the harbour, channel or marina, the red port (left) mark should be kept on the boat’s port (left) side, and the green starboard (right) mark on the boat’s starboard (right) side. May have a red flashing light at night. Shape: Can, pillar or spar. Topmark: (if any) Red can. Light: (if any) Red; any rhythm other than preferred channel. When leaving the harbour, channel or marina the red mark should be kept on the boat’s starboard (right) side, and the green mark on the boat’s port (left) side. May have a green flashing light at night. Shape: Conical, pillar or spar. Topmark: (if any) Green cone. Light: (if any) Green; any rhythm other than preferred channel. If entering the harbour and approaching two channels, the preferred channel to port marker indicates which side the predominant channel is on. If you opt to take the preferred channel the marker should be kept on the boat’s starboard (right) side. Colour: Green with red band. Light: (if any) Green composite group flash Fl (2+1). If entering the harbour and approaching two channels, the preferred channel to starboard marker indicates which side the predominant channel is on. If you opt to take the preferred channel the marker should be kept on the boat’s port (left) side. Colour: Red with green band. Light: (if any) Red composite group flash Fl (2+1). To mark a small danger area with navigable water all around it. This does not mark a danger, but is used to mark mid channels or the beginning of a fairway. There is safe water all around the mark. Marks an area of special significance such as a cable or pipeline, a military exercise area, a recreation zone or marine farm or marine reserve. These marks indicate the side of any point of interest or danger on which it is safe to pass. The deepest water in that area is on the named side of the mark. A reserved area gives swimmers and Personal Water Craft (PWC) priority for certain activities such as skiing and jet skiing. Reserved areas are marked with black and white horizontal banded posts. You may only ski from shore in a water ski access lane or reserved area; otherwise the 5 knot rule applies. Ski access lanes and reserved areas have no special status unless actually in use for skiing. Water skiers may exceed 5 knots within 200 metres of the shore within marked zones only. All ski lanes operate in an anticlockwise direction. You must enter and drop off on the right side of the lane as you face the land. You must take off and exit on the right side of the lane as you face the water. Vessels engaged in water skiing have priority in these areas. All previous directions relating to the closure of areas associated with the Rena salvage operation are withdrawn, with effect from 0800 NZST 05 April 2016. This notice is given by Peter Buell, Bay of Plenty Harbourmaster, in accordance with clause 3.11 of the Bay of Plenty Regional Navigation Safety Bylaw 2010 and section 33F(1) of the Maritime Transport Act 1994. Any questions should be directed to the Bay of Plenty Harbourmaster on 0800 883 880. The Bay of Plenty has lots of recreational and commercial diving opportunities. Always dive in pairs and have an observer in the boat. Do not dive in shipping lanes or areas of frequent traffic. Agree to a dive plan, and then adhere to it. Display the International Code A Flag from the dive boat. Do not exceed 5 knots within 200 metres of a Code A flag. 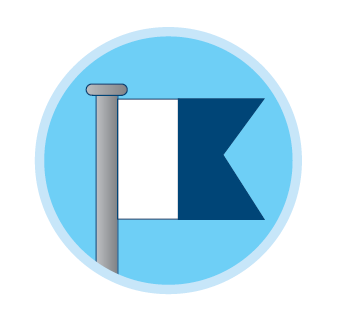 The Code A Flag means: “I have a diver down, keep well clear at slow speed”. The dive flag must not be less than 600 mm by 600 mm in size and must be visible from a distance of 200 metres. All craft must reduce speed to a maximum of five knots within 200 metres of a Code A Flag. This flag may also be attached to a small marker buoy towed by a diver. It may also be flown by craft escorting long distance swimmers.